Very few of my clothes are black. I am aware of the great love for Coco Channel's “little black dress”, but I will always prefer blue, gray, green, and many other lively colors, that ‘light’ dark skin tones and blend perfectly with lighter skin tones. This little ‘Cocktail’ dress design was inspired by the dusk, that sweet time between the tiring day and the quiet pleasurable evening. It’s a time for a nice walk in the city’s streets, a visit to the neighborhood coffee shop or even an intimate cocktail party on one of the city’s desirable roofs. It took me a while to choose the right shape for this model. I knew I wanted a clean-shaped dress, that extended down to the knee, and that the fabric should give it the perfect impact. 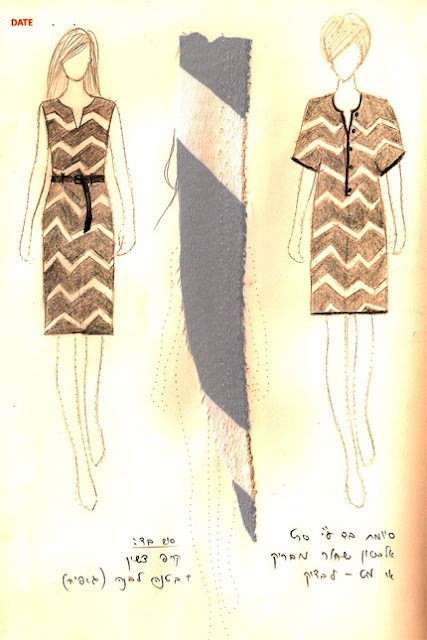 I already chose the fabric – light grey Crepe De Chine with uneven white zigzag stripes. I love knee high dresses, they can be a little above the knee or a little below it… but that’s the idea. This length is very elegant, flattering and will fit anyone. I also designed a belt for this model. I made this ‘Cocktail’ model from another fabric – silk with gentle tassels and see-through stripes. I added a grey lining and the result is before you. The fabric is soft and smooth, the result is elegant but not too binding; you don’t need much to be chic. 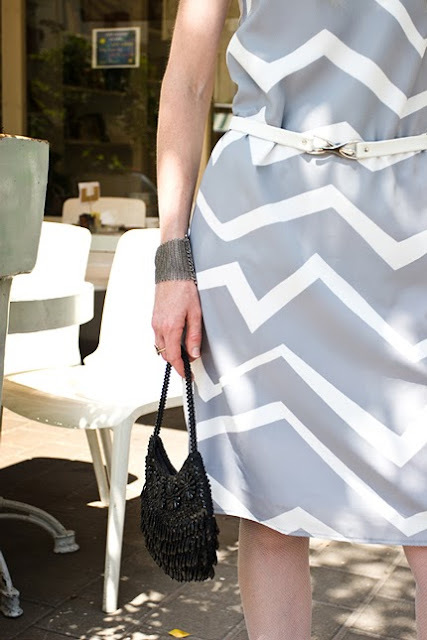 This dress can also go with a belt or without a belt – for a straight shape on the body. A coquettish purse, a fine pair of shoes, a jewel, and you are all set.